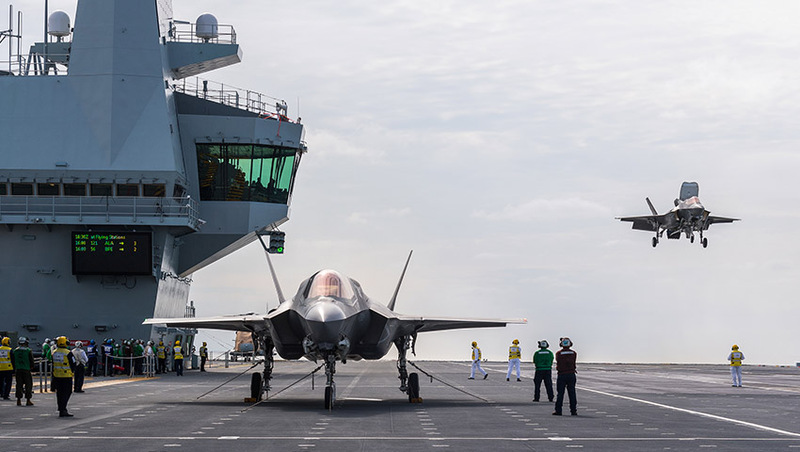 The Royal Navy has completed flight tests for the F-35B aboard Britain’s new aircraft carrier HMS Queen Elizabeth, highlighting the opportunities for further Australian industrial support for allies and the potential for Australian capability development in the future. Marking a major milestone in the march towards operating capability for the troubled 'B' short take-off, vertical landing (STOVL) variant of the F-35 and the Royal Navy, the second phase of development testing (DT-2) provided test pilots, at-sea maintainers and support crew with the opportunity to enhance the operational capabilities of the fifth-generation aircraft. Over the test periods, four test pilots completed a total of 85 flights for a total of 75 flight hours, including 202 take-offs, 187 vertical landings and 15 ship-borne rolling vertical landings (SRVL). Further to this operational testing, the aircraft dropped 54 GBU-12 Paveway II laser-guided precision training weapons providing the Royal Navy crew with the opportunity to perfect the at-sea handling of ordnance under combat conditions. Squadron Leader Andy Edgell of the RAF said, "This has been one of the most comprehensive flight trials at sea ever conducted." The F-35B STOVL variant is the world's first supersonic, stealth STOVL aircraft and is designed to operate from both austere bases and a range of fixed-wing aircraft capable ships. These include large deck amphibious warfare ships, like the US Wasp and America Class Landing Helicopter Docks (LHDs), the UK's Queen Elizabeth Class aircraft carriers, the Italian Conte di Cavour and Giuseppe Garibaldi aircraft carriers, and future Turkish LHDs, which are based on the Juan Carlos/Canberra Class LHDs. The F-35B can also take off and land conventionally from longer runways at major land based airbases. As the primary customer of the F-35B, the US Marine Corps achieved initial operational capability in July 2015, with aircraft delivered to both the US and UK as production, operation and deployment rates begin to increase. This testing program, particularly as a result of the parallel design process between both the F-35B and the Queen Elizabeth Class, provides an important model for at-sea training, maintenance and operations model for considering the development of Australian fleet of F-35Bs. Commodore Mike Utley, commander of the UK Carrier Strike Group reinforced the importance of the parallel design process and the effectiveness of incorporating the fifth-generation platform into a ship, designed to support the aircraft. "This ship was built specifically for the F-35B. So we are seeing a lot of rapid gain in our operating envelopes because the two have been modelled together. We are well through next year’s trials right now because we’ve been able to really put the foot down and get through the different test points," he said. Australia's Canberra Class LHDs, which are based upon the Spanish Juan Carlos Class vessels, are designed to operate a variety of fixed-wing aircraft, including the F-35B, however, Australia's LHDs were not built at the outset to accommodate the F-35B, lacking a number of structural measures and the specialised heat-resistant coatings designed to counter the increased heat generated by the F-35B's powerful turbine engines. Despite this, government and strategic policy influencers have made calls for Australia to consider expanding Australia's existing, $17 billion plan for 72 F-35A variants to include the procurement of the STOVL platform to support Australian expeditionary deployments and provide integrated, fixed-wing, fleet air support. Most recently, in 2014, former prime minister Tony Abbott and then defence minister David Johnston, as part of the then in consideration 2016 Defence White Paper, commissioned a review into Australia's LHDs operating a small fleet of the F-35B variant. While unsuccessful, it served to highlight the serious consideration given to re-establishing Australia's fixed-wing naval aviation capabilities and transforming Australia's maritime power-projection capabilities. In particular, the questions surrounding the impact of operating such a platform on broader defence capabilities, particularly the Air Force, as well as the need to increase the Navy's supporting surface fleet all raised significant questions. Additionally, the costs associated with modifying the LHDs and the F-35B aircraft themselves continue to pose significant challenges. Nevertheless, the option remains, especially as the global fleet and viability of F-35B continues to grow. The potential procurement of Australian F-35Bs supports the the regional fleet of the aircraft variant, as the US Marines continue to expand their operation of the platform and deployment in the region, while Japan continues to consider the introduction of their own F-35B fleet in response to the growing threat of China's own, growing carrier fleet. Additionally, the growing regional F-35B fleet presents additional opportunities for Australian industry, particularly companies like Queensland-based TAE Aerospace and its state-of-the-art engine maintenance facility, which is the Asia-Pacific maintenance, repair, overhaul and upgrade (MRO&U) facility for all variants of the F-35, including the complex F-35B. TAE's specialised Queensland facility serves to help enhance critical regional partnerships at the military-to-military level provides Australia's domestic industry with the opportunity to integrate and collaborate with F-35 industry partners in allied countries as a means of enhancing industry development, collaboration and Australian industry content in global supply chains beyond the F-35. The 15,620 square-metre facility will provide MRO&U for the F135 engine, including the specialised turbine variant, which enables the F-35B to operate effectively from the short-deck, amphibious warfare ships and carriers of the US Navy and the RN. Andrew Sanderson, chief executive and managing director of TAE Aerospace, said, "The biggest growth opportunity for TAE is moving from an initial depot capability, to then begin competing for the broader regional F135 maintenance projects. Building on that enables us to then compete for excess maintenance and sustainment work coming out of the US and even broader global F-35 partners." This leading-edge capability also provides the opportunity for Australia to further develop its sovereign industrial capability through collaboration with key global partners on the F-35 project. This expands beyond just the OEMs, like Lockheed Martin and Pratt & Whitney, to the global operators of the weapons system, particularly allies including the US, UK, Japan and South Korea. For Australia, the technological breakthroughs developed as part of the F-35 program, particularly the F-35B, serve as a test-bed for greater international industry collaboration and integration and is expected to do so well into the future. At both a tactical and strategic level, the F-35B variant would serve to provide Australia with a potent maritime strike capability, not limited by the harsh geographic confines, particularly range, enabling Australia to defend its northern approaches and key strategic interests throughout south-east Asia.